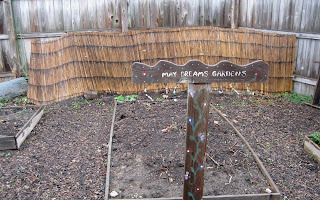 Can You Garden Without Composting? I’ve heard rumors of gardeners who don’t have compost bins. I’m not sure what they do with all the trimmings and leaves and weeds that every garden produces if they don’t have compost bins. Perhaps that’s just something some gardeners don’t want to talk about. Sort of a “don’t ask, don’t tell” as they put it all in bags and send it out with the trash. Compost bins – check! I have three 3’ x 3’ bins, the minimum size you can have and still get enough heat built up for good composting action. I spent most of Saturday this past weekend cleaning them out. Chipper shredder – check! I have two, both are electric. I got one a few years ago, and it does a good job of chipping plant debris into tiny pieces. Then I got a chipper this spring to review, and it also does a good job, though it doesn’t chip as finely as the other one, but has the wonderful collection bin. Compost sieve – check! I made one out of half inch hardware cloth and scraps of wood. It fits perfectly over my wheelbarrow. I throw a few shovelfuls of compost from the bins or the tumbler on to the screen and then push it all through with my gloved hand. What doesn’t go through the screen goes back into the compost bin. What ends up in the wheelbarrow is black gold! 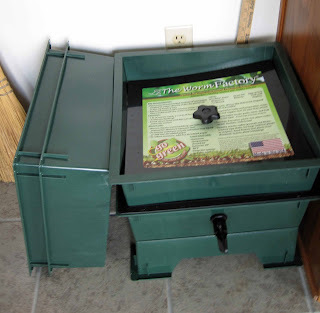 Worm composter – check! I purchased a worm composter a month or so ago at the Indiana Flower & Patio Show, and got the worms about two weeks ago. I’ve got it set up in my sunroom, which sort of horrifies some people, but I like to horrify people sometimes with what I do for my garden. Already, I can see the worms are getting settled in and doing their thing. I’ve even noticed some worm castings in the bottom tray. Compost Thermometer – check! I recently purchased a compost thermometer because I want to see how hot my compost piles get in the summer time. It’s not so much that I’m planning to alter the proportions of green and brown plant material, it’s more a curiosity thing. Though once I see what the temperature of one of the piles is, I don’t know what I might do with that information. I probably have broken a few rules of composting. I don’t turn my piles regularly. I just pile on whatever I have and then periodically harvest what’s in the bottom. I don’t worry about the proportions of green and brown plant material. I just pile on what I have and hope for the best. I don’t water down the piles. I just wait for the rain. I don’t buy any additives to speed up composting. 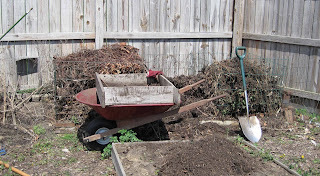 I just add a few shovels of good garden soil when I start a pile, and whatever organisms are in that soil, that’s what gets the composting going. I don’t always chop up every branch I throw in the bins. I just wait longer for them to break down. I sometimes end up digging a big trench in the fall and burying some stuff because I’ve run out of room in the compost bins. Yet, in spite of my sloppy composting techniques, I can report that I always get compost and my compost bins never smell. And I’ve never had problems with mice or rats, either, though I think some squirrels have gotten in there before and buried some black walnuts. Somehow it all works and compost happens. This is a "in progress" view of cleaning out the bins last Saturday. 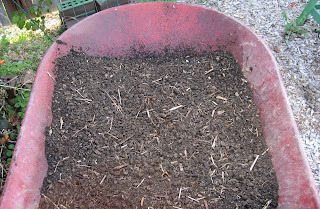 You can see the sieve on top of the wheelbarrow, and the three bins, and a pile of compost on the raised bed. This is what the bins look like after I finished harvesting the "good stuff". The first bin is now empty, the second bin is about one-third full and the last bin has room on top for more, too. My sister-who-doesn't-garden once told me that the compost isn't much to look at. She was right, so I use this bamboo screening to keep it hidden, but still accessible. That "sign" is really a tool rest I made, by the way. This is my latest venture into composting, the worm composter. I'm still working on the first tray, as you can see, or rather the worms are still working on the first tray, with two more trays to add over time. Go, worms, go! 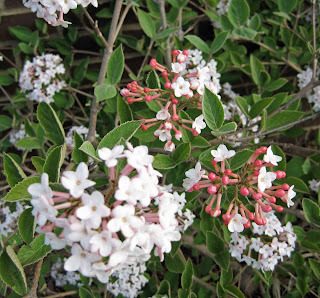 My compost never smells, thank you very much, but I can't say the same for this Korean Spice Viburnum, V. carlesii. It smells wonderful! Go now and plant this shrub somewhere in your garden where you will walk by it all the time in the spring, if you live in zones 4 - 7. You will be so happy when it blooms. Just as happy as you are when you harvest good, dark, rich compost from your own compost bins. I have a modified garbage can as my winter bin (it's near my back door and I collect kitchen scraps in it) and a summer bin I built out of pallets (shredded leaves fill it to the brim in fall, they sag a bit over winter, and then I add contents of winter bin to it in spring, as well as stuff throughout the season). I just connected with a local microbrewery to get their beer waste to add to the bin! (It kickstarts the process.) I'm the only of my local gardening friends who composts; the rest put their waste to the crub as yard waste. Wow you really are on top of the compostingness in your garden. It's so great to see! Alas some gardeners have little space for compost, living in a small apartment the practicalities of a proper sized or even small sized compost bin are, well, slightly insurmountable. As for worms, I wish I could, but I have one of the creepy crawly phobia style things. My mum has a compost bin in the neighbouring state, maybe I could post her my compostables through the mail - then i'd feel less guilty. At least being a small household, small garden, small everything, we have a proportionately smaller amount of compostable waste. Keep up the awesome work! I guess I need to get a compost thermometer. We sort of compost like you, we have compost bins and a big pile of stuff that needs to be shredded. Sometimes we shred stuff, sometimes we just pile it up and use the good stuff off the bottom. I collect leaves in the fall and put them in black garbage bags and let them start rotting there over the winter. That sounds just about like me. One thing I would like to do is put a box similar to a sifting screen box like thing in the bottom of my bins that has a side that flips open to get the black gold out without having to turn the piles. I could use a few more sifters too- and get someone to help ;)! TWO chipper shredders? We'll start the car here in California and be right over to pick up the one you don't want! Sounds like the perfect compost operation. I think things only get smelly if folks put in non-vegetable matter. Is that so? Is that a Lee Valley shovel in the in progress view of your compost bins? Didn't your back start to ache leaning over the compost sieve all day? Carol, I push my compost through the screen with a gloved hand too, but then my gloves get holes in them. Do you use special gloves for this? Yes I have compost. It is a pile. Just one pile and it works well enough for me. If I had a larger garden I would have a larger system, more piles. I am not too scientific about it but it works for me. Hubbie has three compost bins and wants to start another. We love our compost! Still waiting on our viburnum to bloom. My gosh, this is impressive, CArol. I had been keeping branches out of my compost pile, thinking they'd never ever break down, but I'm seeing I just don't have the right tools (including patience). FAb addition to my pile recently: a friend brought me two big sacks of pony poop. I tumbled that right in and am so eager to harvest this "gold" I could whinny. BTW, the only real workout the hoe gets around here in turning the compost pile. I'll confess in public that I don't compost, Carol. But the City of Austin collects residents' yard waste and makes it into Dillo Dirt, which it sells back to the community, so it doesn't go to the landfill or to waste. Thanks for your inspiration! I must do better! Great post! My mom doesn't compost, but her city picks up the yard waste, as does my village. I like your style of composting, it's a lot like mine, very laid back. I have only 2 bins, made out of wire that I've formed into a circle. I must borrow your idea of the bamboo fencing. The area was supposed to have been screened by a couple of shrubs & trellis, but it's not quite enough. I compost all my leaves...and use them. I can't make enough 'traditional' compost from yard waste or kitchen scraps....but I compost it! I wrote on my blog about the cheap composting bin we made about a year ago with a large trash can (like the kind you would take out to the curb on trash day). We really need to make another one though! Before that, I had always just put stuff in the trash. Horrible, isn't it? If I had a fence I'd do more composting. I have a pile in the back that I'm not really supposed to have due to crazy HOA restrictions. I really need a tumbler and a chipper. I don't compost actually. I just throw stuff where I want it in the garden and let the earthworms eat it up. You really have put lots of thought and effort into your composting haven't you and rightly so, I don't know how some gardeners get by without it. Our soil needs compost, it's what builds up the lovely loam we enjoy crumbling through our fingers and the worms swoon over it and the plants - well they reward us for liberal applications of compost with their sights, scents, tastes and texture don't they? compost is a beautiful part of gardening, and does not need to be hidden. i am happy to see that you have wire bins too. i worried that ours didn't get hot enough, since they are so open. i want to build a sifter! what a wonderful idea. i really wish we had a chipper, or, at least a leaf shredder. we pile our leaves up, and let them sit all year to make a sort of leaf mold. our city charges two bucks for each container of garbage taken to the landfill. this inspires us to recycle or compost whatever we can. I have a sloppy pile that I am emptying into the garden right now, and a black compost bin that gets used during the winter. But I'm building a new slightly less sloppy compost pile near the new Potager. No matter how sloppy, the pile never smells. I also have a worm farm and I'll harvest the castings when I start serious planting. Judging by all the yard waste bags on the curbs in my neighborhood, I assume most home owners or gardeners don't compost. Our city does collect the yard waste and recycle it, which is good, but I would rather keep that stuff in my yard. It's a free resource! I've thought about buying those nifty wire bins, but ended up going with the cheaper option of building our own bins w/cedar posts and chicken wire. It works. I pretty much just throw whatever into the pile w/o worrying about ratios. It really doesn't matter that much. Compost will eventually happen; it's just a matter of how fast you want it. I'm a compost fanatic. Love the stuff. I can give myself a check with everything except the chipper, and that's on my list to have by the fall. Two chipper shredders sounds like a pretty serious commitment to composting. I agree that it's hard to understand how people could have a garden (or even a kitchen) without a compost bin, but I don't know how people actually devote the time, effort, and sunshine to have the compost happen quickly. Compost happens in our yard, but slowly. Well, we struggle with even getting a nice bin approved in our neighborhood, so my guess is as things die off in my veggie garden we'll scar the neighbors by dumping our veggie peelings etc right on the pile!